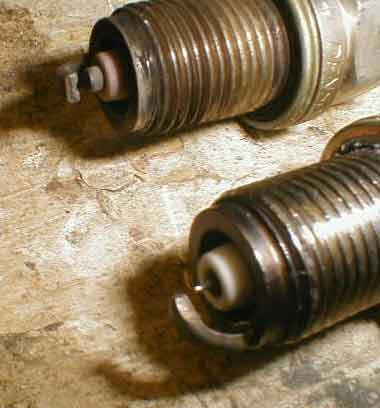 Iridium spark plugs are new to the performance scene, the tecniques to cut the hard substance and price of manufacture have kept them too pricey until recently. Denso has begun marketing their Iridium based plugs, and also sells them to HKS for their own branding. They're available from many places online, and even a few i-club members have been selling them. I got mine almost new, at a significant discount, from an Impreza owner selling his turbo kit. "ridium: 8 times stronger than platinum, 6 times harder, and with a melting point 1200 degrees higher. 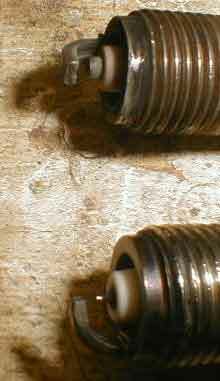 New laser welding techniques make it possible to make a spark plug with an iridium electrode. The result is a plug that requires less voltage to spark, burns more of the fuel in the cylinder, and can spark at LEANER air/fuel mixtures (see inset diagram), resulting in higher horsepower and better gas mileage." I got a set of the colder range plugs for my turbo and went for the install, replacing the ordinary Denso plugs i've had in for less than 5000 miles. Install isn't hard, but it's made a lot easier by having the right tools. A ratchet with a full and half-sized extension, plug-sized socket and 10mm socket are all that's really needed. First, remove the washer bottle retaining screws, unplug the pump plug, and set it off to the side. This will give you good access to the driver side. The close plug will come out the easiest of them all, simply attach the socket to the full and half extension, loosen and remove. The rear plug will be a little hard to get to because of the crankcase breather hose. If it's pliable enough, you can just move it out of the way just a bit and get the driver in to remove the plug. The passenger side is tight, but can be done without taking the intake apart and removing the airbox. First, attach the socket to both extensions and get it on the plug, then put on the ratchet and loosen. remove the ratchet when it's all the way out. The rear is even tighter, but it can be done in the same way. Be patient. Install on the passenger side is the reverse of removal, simply put the plug in the socket with extensions attached and thread it in as much as possible before putting on the ratchet. Same for the rear. The driver side is a bit easier, reverse of removal. Remember to plug in the washer pump when bolting the reservoir in. It's hard to tell a difference after install, the engine is still very smooth on acceleration. They're at least as good as the ones i removed. Shiv from Sport Compact Car said they leaned out his car a little which should improve gas mileage and promote better combustion. We'll see if there are any fuel mileage improvements, but i'm not holding my breath.